My experience with Chris Hurd, realtor for the sale of my house, was truly exceptional. His professional advice was extremely accurate and helpful, especially in a sluggish market. He explained every decision in a way that was detailed yet easily understandable. Throughout the process, Chris offered informative suggestions and sales updates regarding my neighborhood and comparable sales in surrounding towns. Chris attended every showing of my property, particularly when I was unavailable and therefore unable to provide personal information to prospective buyers. His willingness to visit my property hours before each showing to adjust thermostats and window blinds for optimal presentation demonstrated his sincere desire to help sell my home. He even stopped by my house intermittently to check on the plumbing and make sure no general damage had occurred in my absence. There are very few realtors who would go to such trouble to help keep a house secure and find the right buyer. I felt he constantly had my best interest at heart throughout the entire process. Chris’s expertise in listing my property, negotiating the contract, and meeting all closing deadlines made the challenges seem routine. My expectations were exceeded at every step; I would happily use his services again and have already recommended him to friends. In fact, he did such a great job with the sale of my house that I called him 6 months later to represent me as a buyer when I found a property to purchase. Just like the first experience, Chris was invaluable negotiating an offer, securing a contract, and completing the process of buying my new home. Thanks, Chris, for making such challenging and important experiences so positive! As a former real estate investor, I’ve been involved in hundreds of residential real estate transactions. With my extensive experience, I’ve come to view agents as largely unnecessary and as something to be avoided. Not so with Chris Hurd. In contemplating a move to Burlington from Los Angeles, my wife and I realized that we’d have to find someone who could help. I found Chris’ webpage and was impressed by his implementation of social media and online marketing…a critical component to a successful real estate business. On the telephone, he was refreshingly honest and knowledgeable. A week later we booked a date. Our summer visit was fantastic and Chris played a critical role. Any doubts I had about him faded quickly during an extensive tour he made of the area and of several properties. Chris possesses a keen intelligence, a tremendous work ethic, and is generous with his time and with sharing who he is as a person. Most importantly, I trust him. My wife and I plan to buy in the Burlington area. We see Chris not only as our advocate, but also our friend and look forward to working with him in the months ahead. It is our pleasure to give the highest possible recommendation to potential clients for our Realtor, Christopher Hurd, who helped my wife and I purchase a home in Jericho, Vermont. The average agent would have rolled their eyes when we walked into their office with only the vaguest idea of what we wanted, when we might buy, and what our price range was, with the caveat that we were trying to figure this out during the few days when I was home on leave from my State Department position in Afghanistan. Undaunted, and with a welcoming smile Chris began to lead us on our house-hunting journey, patiently answering our questions and offering advice from his years of experience, but always leaving us in control of the process. After two rounds of house visits we had reshaped our plans and began to explore the exciting, but far more complicated option of constructing a home. Again, Chris was fully supportive, but also completely candid about the costs, pitfalls, and timeline needed to navigate this process. Eventually, we decided to follow our dream and build a house on a lot that Chris found for us which was in the perfect location. A flurry of meetings, countless emails and Skype chats ensued as Chris led us through the maze of contracts and options, keeping me one hundred percent involved despite the distance. As I conclude my tour and head back to Vermont, the finishing touches are being made on our dream house, and we are deeply grateful to Chris for guiding us down the long road which led to this deeply satisfying outcome. If you are looking for a home in Vermont we cannot recommend Chris highly enough, as you cannot find a more knowledgeable, patient or personable advocate anywhere. We would be pleased to discuss our positive experiences with any prospective clients, and can be reached at [email protected], or at 802-233-6756. Chris thank you for your help and time over the last six months!! We looked at over thirty properties all over Chittenden County and beyond. Your proactive communication helped things to go smoothly. We appreciated your patience and the absence of pressure when we were looking at houses. It seems like you knew, in time, we would find the right fit. It is clear you bring a lot of enthusiasm to the real estate business and that you enjoy helping clients to find the best home for their families. I would like to highlight Chris’s proactive communication, unbelievable patience and time that you put into helping us and that you really enjoy doing this and that representing buyers is your focus. Chris you proved you were willing to really negotiate with price which some Realtors shy away from. We would like to point out that Chris is well versed in helping buyers buying from afar. Thank you again for all your efforts, patience and practical know-how you exhibited throughout this process. We wish for you a wonderful rest of 2012 and beyond! It is with enthusiasm that I recommend Chris Hurd for the toughest of real estate challenges – all that goes into getting to a closing. As a real estate broker for many, many years in Sarasota Florida, I know fully the difficulties of successfully closing real estate transactions particularly these days! Chris helped us to purchase a home in South Burlington. 7 years later in a declining market, Chris was able to effectively manage 4 tenants living in the home while he marketed the property, negotiated terms and quarterbacked a successful closing when several last minute “issues” look to derail the deal. He kept it together going above and beyond the call of duty in a professional manner to make sure the deal held. His attention to detail and timely communication made it easy for me, as an absentee landlord selling cross country, to feel confident that the deal would get done! Chris Hurd gave us the most useful feedback of any Realtor we met, helping us choose Vermont. We had some unconventional ideas and would need a very specific situation to make it all work. At first, he pointed us to the Champlain Islands, which were just fantastic. After a year of exploring however, it became clear that the soil and water table conditions were going to make it difficult to build our unconventional sustainable house design there. He indulged our quirks for another year while we explored plots in Chittenden and Addison Counties, finally finding 2 promising plots in Huntington. Chris helped us prioritize and then negotiate for our favorite plot. There were complex issues. The seller’s final price would only be acceptable if the plot conformed to certain specifications that would keep building costs manageable; and to find that out we needed to dig test pits on the property. Chris helped us work that into the negotiation. It turned out that the title to the property had gone through numerous changes in ownership and the land itself had been subdivided over the years, putting question marks on easement rights. Chris found us a crack legal team who worked diligently through those issues and brought the whole thing in for a nice soft landing. For two and a half years he held our hands navigating our first entry into the world of property transactions – not to mention that he got it all done even though I was 12,000 miles away in Asia for most of that time. Email, skype, faxes, scanned pdf documents, all played a major role in this process, at every step Chris was on top of the situation and in close contact. I can’t recommend Chris Hurd strongly enough as someone to have by your side. I would like to convey the complete satisfaction that my wife, family, and I feel with our decision to use Chris Hurd as our Buyer’s Agent when we recently moved to Vermont from Milwaukee Wisconsin. We were new to the area, leaving a much larger city and we needed a lot of help to find just the right home. Exasperating these issues, there was a fairly slim supply of Lake Champlain waterfront homes that fit the profile we were looking for at the time. By taking the time to listen carefully to our family’s needs and desires, budget and life style, Chris was able to help us focus quickly. He knows the area exceedingly well and was well versed on virtually every home on the market at that time. This knowledge enabled us to see potential homes very efficiently, commensurately gaining our confidence in the local market and what it would take to achieve our housing goals. Chris worked diligently throughout the initial phases of our getting to know this market, and never balked as I asked him to see more and more homes in an ever-widening area. This process and his energy enabled us to have confidence in bidding on a lakefront property after only a month or so of looking. In preparation for our Purchase Offer, Chris provided expert professional council, w/o pushing us to a level we were uncomfortable with. He let the bidding process unfold at a natural pace and once our bid had been accepted, Chris did all he could to ease the ensuing process of inspections, financing right through to the closing. From front to back, Chris acted with professionalism and integrity and I have only the highest regard for his services as a Buyer’s Agent. There I was last May of 2011, a potential first time home buyer that was ready to start looking for my first house. My girlfriend and I had been living in a one bedroom apartment for the past 3 years and we were we were ready to step up to own our first home. Initially, I thought I might attempt to tackle the process on my own. I figured that I am a relatively intelligent person and it can’t be that hard, right? Wrong. The more I learned about the home-buying process, the more I realized that without some help I could find myself in a pretty bad position very quickly. I went on Google and started searching for a buyer’s agent to help me with the process. Now, I will admit I have some trust issues; I was really worried that whoever I had represent me was going to make sure they got the most money possible at closing, but I figured that I was eventually going to have to trust someone. That said, I was determined to due my homework and pick someone that I felt would have my best interests in mind as we looked for a home. It was at this point that after reading numerous reviews of Buyer’s Agents on numerous websites that I came across Chris Hurd’s testimonial page on his website. Now, if you’re reading this you are most likely in the same situation, or one similar, that I was in this past May. I had already done some homework on Chris and learned that he has been representing home buyers in this area for many years and handles deals from the low end to upper end of the cost spectrum. What sealed the deal for me were the reviews I read of Chris from people who were in my similar situation (looking for a home around $200,000 or less, still somewhat close to Chittenden County) and stated that Chris made them feel as if they were one of his customers looking to close a multi-million dollar deal. At that time, I made my first cold call to Chris and the adventure began. I am a disabled Veteran and needed to use the VA loan guarantee in order to be able to afford our first home. I explained my situation and my cost/location parameters to Chris and he tackled the challenge head-on. Over the next month and a half, we had Chris set up viewings on at least 15 homes, many on short notice. From the very start of the process, Chris was professional at all times and extremely accommodating to our schedules. Chris took a special pride in helping a Veteran find his first home. This was evident in his actions as well as numerous comments that he made indicating that he felt it was an honor for him to be able help one of this Country’s Veterans find their first home. Together, we entered into three total negotiations on three separate houses before we found the deal that worked for us. At no time did Chris pressure me to go outside my comfort zone as far as prices and location go. During our first negotiation on the first home we tried to buy, Chris handled a very aggressive Listing Agent with the utmost class and professionalism in the face of extremely rude behavior. If I had attempted to buy this home without Chris, the experience very well may have caused me to walk away from the process altogether. Chris was forced to go out of town twice during our search for a house, and both times, everyday he was gone I received either a phone call, fax, or email. At no time did I feel lost, confused, or abandoned during this process. Chris was extremely patient when answering the numerous questions I had, some asked more than once, and even intervened to help smooth over some complicated issues with my lender. Chris takes an immense amount of pride in his profession which is evident in every aspect of his performance. Within two months of beginning the house buying process, we were closing on our new home that exceeded both of our expectations in the exact location that we wanted to be in. None of this would have been possible without the guidance and knowledge that Chris brought to the table. Both my girlfriend and I feel that we not only gained a trusted business partner in all our future Real Estate transactions, but we also gained a life long friend. I have recommended Chris to everyone I know that is thinking about buying a house, and I would not hesitate in the least to highly recommend him to you. I told Chris when I met him that I did not hire him for his expertise alone. I hired him because I knew I was getting more than just another Realtor. I was getting all that and… an advocate with many years of real estate experience in our area, a confidante and trusted advisor for my needs as I traversed the ambiguous waters of home selling. And it turned out to be more than true in a very big way. When I left town for my mom’s funeral, a buyer materialized at the worst possible time for me. Chris handled everything while I was away for two whole weeks with a steady hand on the tiller. Chris held my hand through out the whole process and then some for my whole family. And let me tell you…my process was not exactly a cake walk! His warm yet firm manner supported me through open houses, qualified and unqualified buyers, animals ruining rugs, emotional ups and downs, juggling teenagers and all the last minute final details leading right up to the closing. In fact, several times, I needed an emergency contractor to come and take care of something. Chris was always right there with an excellent referral to a contractor who would solve the matter. When we sold my property, it went for less than 1% of my listed price. I would absolutely recommend Chris as a Realtor and as my now dear friend who not only knows the area and all of its options, but as a professional partner to any project you want a team player on. Thumbs up all the way to Chris Hurd! Throughout the process of searching high and low for my dream home, Chris Hurd was good humored, professional, and unbelievably patient. He took the time to weigh the pros and cons of each property he showed us. We talked about the layout of the houses, cost of up-keep, cost of renovations, the school systems, the neighborhoods, regional outdoor recreation attractions, access to daily needs (i.e grocery store, pharmacy, bank etc) and proximity to hazards for our three children (all under the age of six). There was no stone left unturned. Chris listened to our impressions and concerns about each property with level headed resolve. He helped us to make informed buying decisions and, as a team, we navigated the endlessly complicated waters of buying a home. 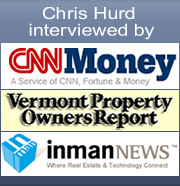 I highly recommend Chris Hurd to anyone looking to buy property in Vermont and looking for a buyer broker. Everyone says that buying a house from overseas is nuts. We were attempting to come back to the states from having lived in the Middle East for 5 years. After a few disappointing attempts at corresponding with other Realtors, my husband found Chris’s website on Google, researched his testimonials and experience as a Buyer Representative and then asked me to contact him. Not expecting much based on a couple of “used car salesmen” types that I had recently experienced, I once again outlined my story: US expat planning to relocate back to the States, have a job interview in Vermont, this is what we think we can afford, can you help us? Even before I received a job offer, Chris offered to spend 2 entire days driving me around the state in search of the perfect house for our needs. To me, this is proof that Chris goes above and beyond the call of duty. He gave us guidance on the various public school districts and advised us on aspects of the state like only a native could. As so many other testimonials have stated, Chris remained patient and professional throughout the entire process. I particularly liked his honesty; his candid personality made everything so much easier than I had ever imagined. He offered his opinion when I needed to know if I was on the right track. It became clear to me within the first hour of our meeting that he is the real deal. So, I finally get the job and Chris puts things in motion. Working with a 7-hour time difference, he tirelessly arranged his schedule to accommodate my phone calls. He got us an excellent price on our favorite house. The people he put us in touch with for the inspection, the paperwork and everything else made us feel like we were right there. And now that we have moved in, Chris was kind enough to check up on us a couple of times. I can’t imagine a better buying experience than the one we just had. Thank you for everything, and I wish you so much success. As I am settling in to my new home, I look back and am amazed at how well everything worked out. When I first saw the home and called the listing agent, Chris Hurd, my hopes weren’t high. Though I loved the location and thought the house would be a great fit, the list price was a nonstarter for me. Still, I gave Chris a call and had a look at the home. Chris was professional, easy-going, and never put any pressure on me. Though he represented the seller, he was always prompt and reliable in answering all my questions and hearing my concerns. I was frank with my research and reasoning, and Chris responded with respect and transparency. I always felt Chris listened and understood. While the seller and I remained far apart on price, Chris kept us talking and worked with us to problem-solve our way through and generate creative compromises with humor and patience. When I didn’t see a way forward, Chris persevered. He professionally combined the roles of mediator, therapist, gracious host, and astute real estate agent with easygoing aplomb! He effortlessly accommodated my impending overseas travel date, booked a half year earlier. If I were to need an agent in the future, I would not hesitate to turn to Chris. He remains constantly accessible, on top of things, and detail-oriented, all with a friendly, easygoing presence. I’m still not sure how Chris managed to bring both the seller and myself to a price point we were both satisfied with, but he did it, and he did it graciously! Thank-you very much for taking us around to all the different properties this afternoon. Your tour helps us to have a better appreciation of all Vermont has to offer. We like the Appletree Point location and all it has to offer but also see the virtues in owning a property such as the one on Lake Champlain at Long Point. In other words we are open to exploring both types of real estate. We are very happy we have met you and can see why you have such glowing reviews on your web site! “As out-of-state buyers, we had to trust Chris to handle so many details. He set up our viewings and when we arrived in Vermont gave us a tour of the area. He also wisely showed us several other houses so we could be certain that our first choice was the right one. Once we returned to Florida, he deftly handled everything else. We relaxed, sold our house, packed up and moved. When we arrived all was in order. The closing went smoothly and we began our lives in Vermont having had a very positive real estate experience. “Thank you for making this all possible, Chris! When my fiance and I decided the time was right to buy our first home we searched for a broker and decided that Chris’ ease, assurance and experience was exactly what we needed for navigating the real estate market. We looked at many houses and Chris was always there to point out the pros and cons of each one, letting us take our time evaluating, and even entertaining our two year old son outside so we could walk through the house in peace and get a feel for each location. Chris helped us decide, negotiate a good deal, and walk us through the closing with confidence. I recommend Chris Hurd and will use him again when it is time for us to “move up”. “In the Spring of ’08, my wife and I decided to relocate from New York City to the Burlington area. We needed a realtor, and while house hunting on the web, came across the web site of Chris Hurd. It was a lucky break for us. My wife and I are picky customers, and Chris patiently showed us a few dozen homes before we found the one that was right for us. Many times, we flew up from NY to the Burlington airport, and there would be Chris, waiting to pick us up and show us properties. On a number of occasions, he would even go out of his way to show us some interesting landmarks or areas. His knowledge of the greater Burlington area, and the State of Vermont is extensive. Gary De Carolis – Washington, D.C.